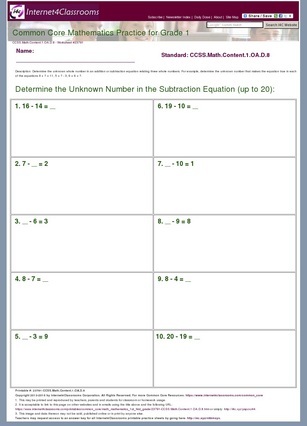 It is also acceptable to link to this page on other websites and in emails using the title above and the following URL: http://internet4classrooms.com/printables/common_core/math_mathematics_1st_first_grade/description_download_23791-CCSS.Math.Content.1.OA.D.8.htm or simply: http://i4c.xyz/y8qlcd4r. The answer key corresponding to this worksheet may be found here: http://i4c.xyz/ycqj6xwg. 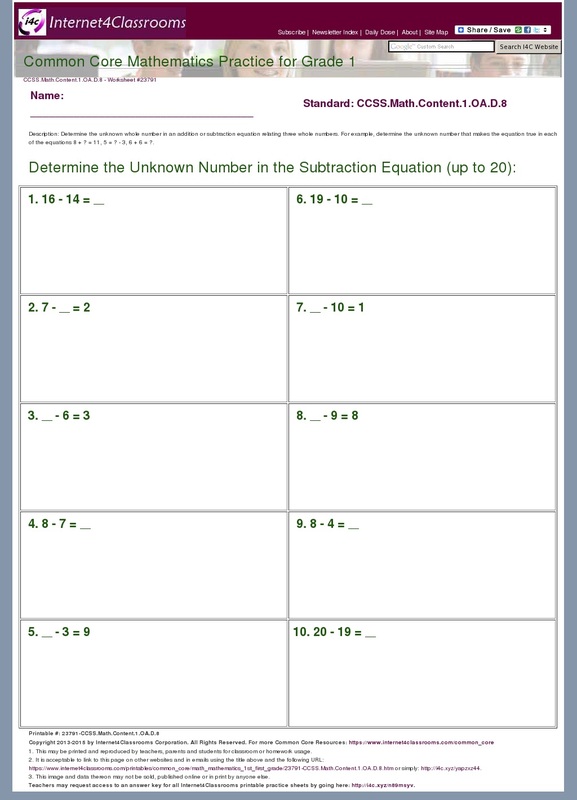 Problem Type: Determine the Unknown Number in the Subtraction Equation (up to 20). Determine the unknown whole number in an addition or subtraction equation relating three whole numbers. For example, determine the unknown number that makes the equation true in each of the equations 8 + ? = 11, 5 = ? - 3, 6 + 6 = ?.